The proposed PIPA and SOPA legislation has been roundly criticized with solid, logical arguments here by danah boyd, here by Tarleton Gillespie who links to 16 other authors who have argued against SOPA/PIPA, and here in a letter Harvard Law Professor Laurence Tribe sent to members of Congress. As someone who is a passionate scholar of collaboration (both in its cooperative and competitive forms), I worry about the legal and economic repercussions of SOPA/PIPA that have been brought up by the authors mentioned above as well as the negative impact the threat of discretionary censorship would have on the kinds of sharing and borrowing that have made the internet and digital files such a rich source of remixing, incremental improving, and all around innovation. There is no way I could put a dollar figure or other empirical metric on what might happen to remix culture (what the cool kids call it) or innovation (what the business schools call it) under a legal regime in which just about anyone can censor just about anyone else. I can say that the internet as we know it would cease to exist. I post things here on Graphic Sociology that I have designed and created without even mentioning Creative Commons or standard copyright or anything else. If people take my work and get something out of it, that’s fantastic. I don’t even care if they give me credit, though many creative people do, and for good reason. I’m afraid if PIPA and SOPA were to pass, fewer people would re-mix my work and that’s the best kind of use, as far as I am concerned. Reposting is fine, remixing is divine. I also post the work of others and critique them as an academic, something that is legal under the fair use doctrine. I’m not sure how SOPA and PIPA would mesh with the particular provision of the fair use doctrine that I am exercising. Presumably, they can co-exist, but I certainly don’t have the resources to hire a lawyer and defend myself against anyone who might claim that I’m violating SOPA/PIPA. And as just one of a family of bloggers, any infringement claim against any blog post on the society pages could darken the entire site. So if someone got upset with me, that would mean lights out for Sociological Images, Thick Culture, and all the rest of the blogs here. The rest of this post is written by guest blogger Alec Campbell of Reed College in Oregon. 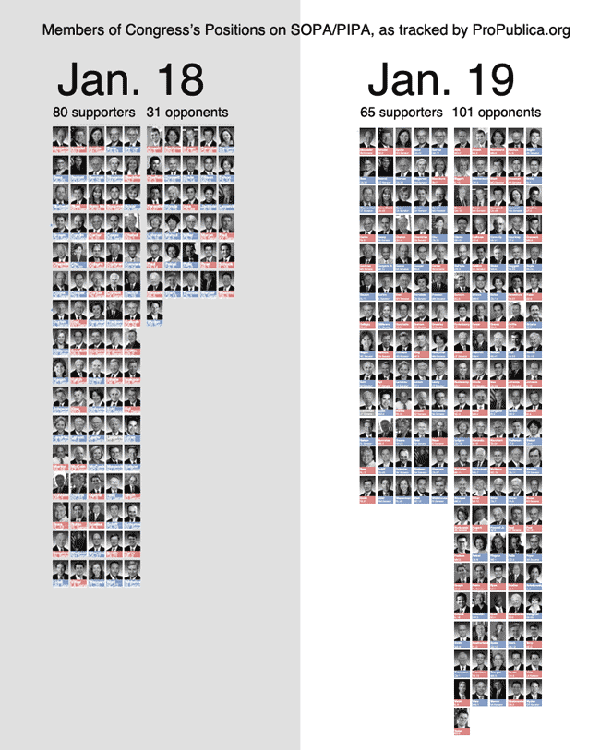 This graphic clearly shows that something caused a change between January 18 and January 19. That something was almost certainly the focused attention on SOPA and PIPA resulting from shutdowns, blackouts and other actions taken or led by a number of popular Internet sites (wikipdedia, reddit, the Social Media Collective, and even here at thesocietypages there was a blackout of sorts). The most important flaw in this graph is that it excludes members of congress who are undecided or whose opinions are unknown. Looking at the graph it appears that the distribution of opinion moves from 72% in favor before the Internet shut down to 39% in favor after. In reality the distribution is 15% in favor, 6% opposed and 79% unknown/undecided before the shutdown and 12% in favor, 19% opposed and 69% unknown /undecided after the shutdown. The two graphs aren’t comparable because they don’t include the same total number of observations. 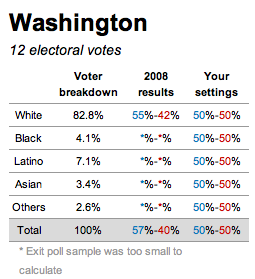 When comparing populations of different sizes one has to compare percentages which this graphic does not do. that does include a full accounting of all members of congress. However, those data don’t allow for comparison over time, which is the central point of this graphic. It’s clear that there are fewer supporters on January 19 but it isn’t clear if the people who no longer support PIPA/SOPA now oppose it or if they are now undecided. Did the Internet action make converts or agnostics? Arstechnica is keeping a running tally of Senators who are now opposing PIPA, including many of the former co-sponsors of the bill. The graphic could have used arrows to show movement from one of the three camps (supporters, opposers, undecideds) to help illustrate where the movement happened. 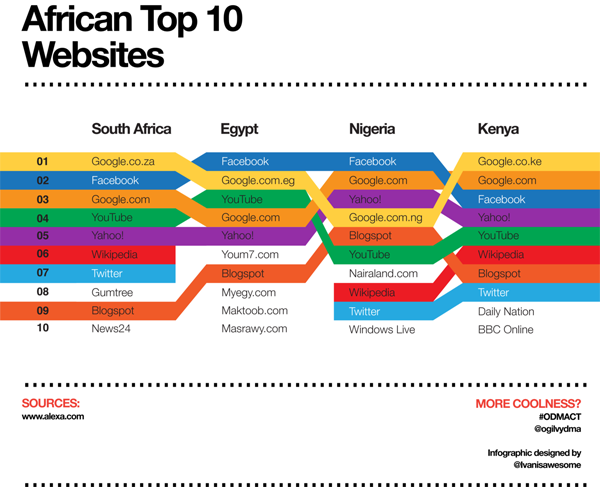 None of this matters much if our interest is in the fate of SOPA/PIPA. It matters a great deal if we are interested in the power of Internet protest. This graphic is about the power of protest because the prominently displayed time dimension is only relevant to this issue. 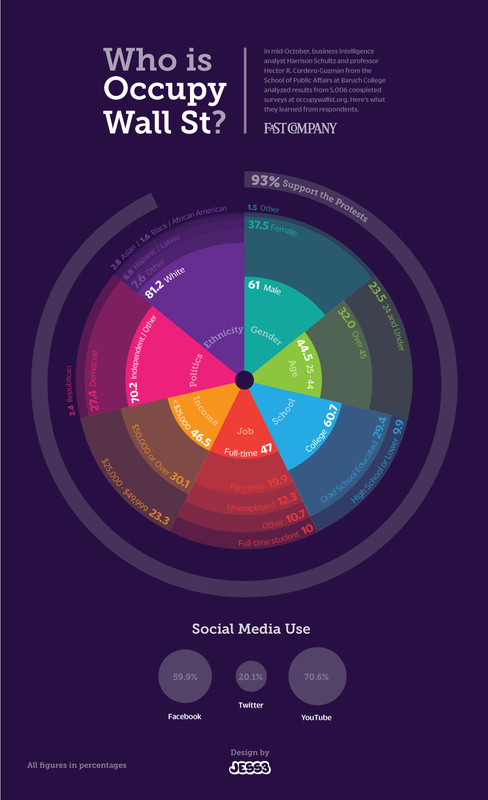 This graphic overstates the power of Internet protests by omitting the unknown/undecided category making it appear that people changed their minds overnight. Clearly, some did. The number of supporters dropped in absolute terms. However, the larger effect is in convincing people to publicly state their opinion or to finally make up their minds. It is entirely possible that the major effect of the Internet protest was to get congresspersons that were leaning towards opposition to publicly state their opposition and force some supporters to claim an undecided status. That is certainly something but it isn’t the same thing as changing supporters into opponents, which is what the graphic implies. It seems a rare act of civic sacrifice: in the name of deficit reduction, lawmakers from both parties are calling for the end of a longstanding agricultural subsidy that puts about $5 billion a year in the pockets of their farmer constituents. Even major farm groups are accepting the move, saying that with farmers poised to reap bumper profits, they must do their part. 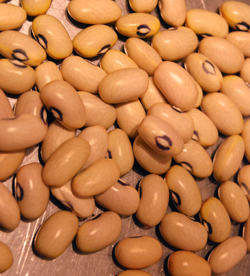 But in the same breath, the lawmakers and their farm lobby allies are seeking to send most of that money — under a new name — straight back to the same farmers, with most of the benefits going to large farms that grow commodity crops like corn, soybeans, wheat and cotton. In essence, lawmakers would replace one subsidy with a new one. My curiousity was piqued, to say the least. Farm subsidies have long been an emotionally charged issue – Professor Smith is right to point out that the family farmer is an icon in the American zeitgeist whose ideal type gets trotted out as a narrative to support subsidies that often go to large-scale corporate agriculture. Before mounting my own angry response to what appears to be both hypocritical and a well-orchestrated marketing schmooze (ie the public proclamation by various farm lobbies that they are willing to take fewer subsidies as they band with the rest of the beleaguered American public in a collective belt-tightening process while simultaneously opening up other routes to receive the same amount of funding through different mechanisms), I decided to go in search of some hard data to see what is going on with agricultural subsidies. I found two great sources of data. First, the USDA runs the National Agricultural Statistics Service which publishes copious amounts of tables full of information about how much farmland there is in the US, what is grown on it, what the yields are, what commodity prices are, what farm expenditures are doing, and all sorts of rich information. Linked from the article was another source of data – the Environmental Working Group – which has been tracking farm subsidies for years. The Environmental Working Group also relies on the National Agricultural Statistics Service, especially for farm subsidy information. Between those two sources, the US Census, and the 2012 US Statistical Abstracts (Table 825 especially), I had more than enough information to start putting together a graphic that could describe at least part of what is going on with agricultural subsidies. Because farming is distributed unevenly around the country, I knew I needed to come up with a set of numbers that went beyond absolute dollar amounts per state. Probably it would have been nice to see where subsidies go per crop, but other people have already done that. To look at agricultural subsidies overall, and to work with the state-by-state data that I had, I ended up considering three approaches. 1. Absolute commodity subsidy amounts per state. 2. Commodity subsidy amounts per capita. 3. Commodity subsidy amounts per farmland acre. It is obvious that the third option, looking at the amount of spending per acre within each state, is the best. I expected to find that states with small amounts of farmland would be relatively more expensive per acre than states with large amounts of farmland. I assumed there would be economies of scale and that states with very large amounts of farmland probably had a lot of that land dedicated to pasture, which is pretty cheap to maintain compared to something like an orchard. I decided that simply showing the costs per acre might not be as interesting as keeping the absolute amount of farmland in play and doing some kind of comparison. My first attempt to do something similar looked like this. There is no obvious pattern – it looks like a rat’s nest. 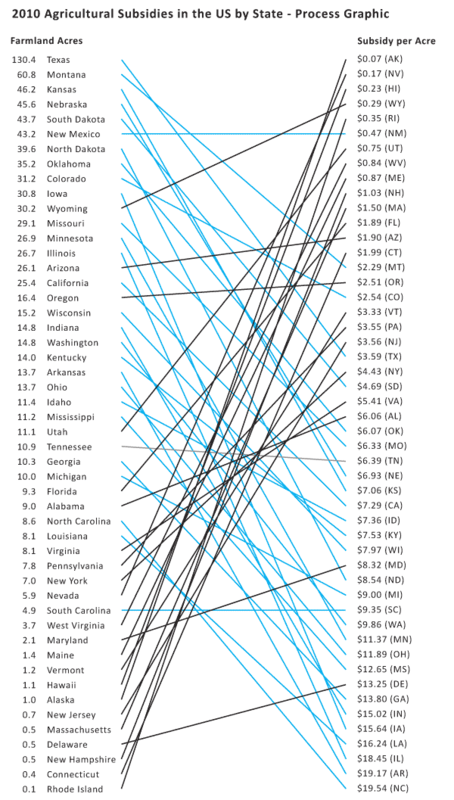 The states with bad ratios – the ones where we are paying more than $10/acre – have upward sloping lines connecting them from the left column to the right column. Psychologically, the ‘bad’ deals should have downward sloping lines. It just makes better visual sense. Pink was supposed to be along the lines of red on accounting sheets but it looked too cheery to indicate being ‘in the red’. I got rid of the pink altogether and flipped the scale on the left so that the best deals – the lowest per acre subsidy costs – are at the top. This means that states that are taking less per acre end up having upward sloping lines more often than downward sloping lines. Thinking through this brought up some larger concerns. Comparing by rank alone is ridiculous. The space between each listing in both columns is extremely critical in a graphic like this and needs to be scaled appropriately. 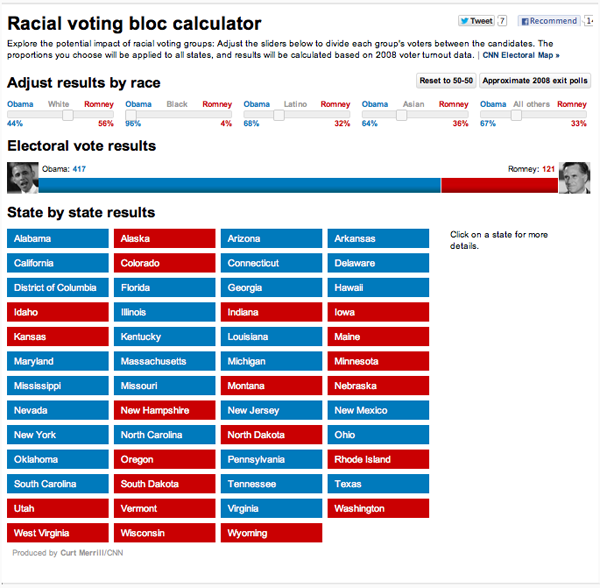 For instance, look at Alabama ($6.06) and Oklahoma ($6.07) in the right hand column. They basically have the exact same amount of spending per acre and yet they are the same distance apart as Washington ($9.86) and Minnesota ($11.37). 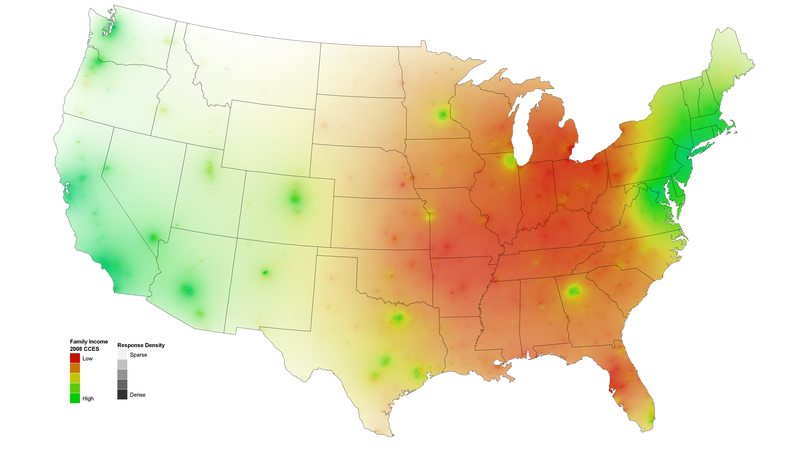 The same problem happens in the lefthand column – states with about the same amount of acreage dedicated to farmland have the same distance between them as states with large differences in the amount of acreage they have dedicated to farmland. Click here to see a pdf of the whole graphic. I scaled both the right and left hand columns using a log scale for farmland acreage (though the number of acres is still given in absolute millions of acres – only the visual arrangement was logged). The pattern is still messy and hard to discern, though clearer than in previous versions. 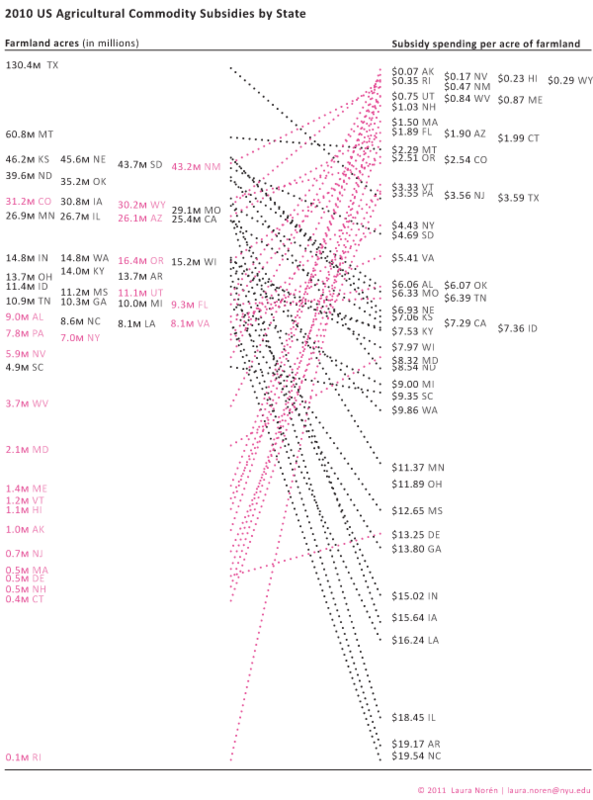 In order to bolster the pattern, I turned the ‘good deals’ in the lefthand column pink. The states with less acreage dedicated to farmland routinely receive less subsidy per acre than some of the bigger states. But the very biggest farming states – like Montana and Texas – are also pretty affordable on a per acre basis. It was states near the middle of the pack that were coming in at $18 and $19 per acre of commodity subsidy spending. I thought maybe it was a weather event that led to some of the larger subsidies. But if that were the case, states that were geographically near one another would probably have had the same drought/hurricane/flood and should have received similar funding. There is work to be done on the weather question – looking at data over time would be a good step in the right direction there. However, I don’t know that weather is going to be the best answer to this question. 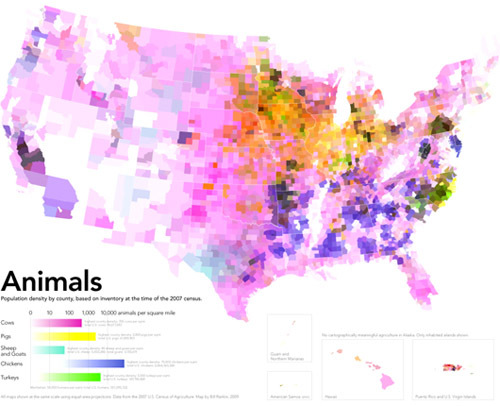 Look at Washington and Oregon. They are geographically right next to each other, grow some similar kinds of things, and have a similar amount of farmland acreage yet they have dramatically different amounts of subsidy spending per acre. Washington takes $9.86 per acre; Oregon gets $2.51 per acre. 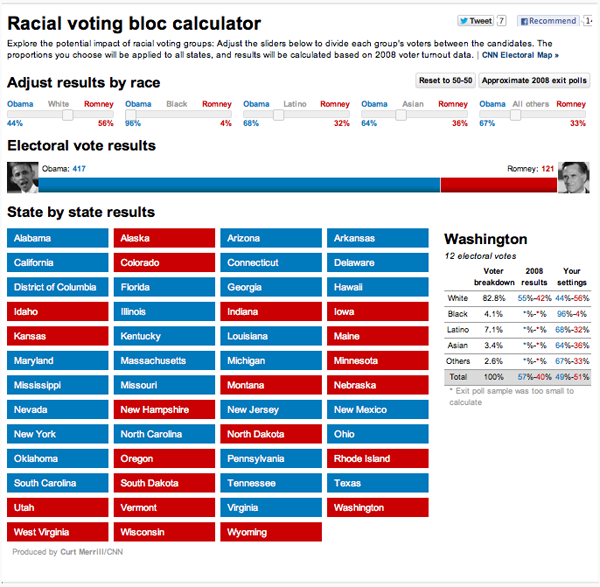 It’s still unclear why there is such a great disparity between these two states in 2010. Through the construction of this information graphic, I falsified my own hypothesis. The states with the smallest amount of land dedicated to farmland received the least amount of commodity subsidies. I have some thoughts about what is going on. They will require more data analysis and graphic development to suss out and represent completely. 1. It’s the weather. It could still be the weather. I did not do enough investigation into this variable, though this seems like a weak hypothesis. 3. It’s lobbying. The states that are known to be “big farm” states seem to have more funding than smaller farm states. Maybe they are better represented by the farm lobbies and therefore end up with more subsidy per acre than states without strong representation from the farm lobby. This hypothesis has an overlap with the “it’s corn” hypothesis. There are two kinds of conclusions to be drawn. On the agricultural front, it is safe to conclude that Americans spend a good bit of money per acre of farmland; there is no free market on the farms. Bigger states do not offer economies of scale compared to states with less farmland acreage. No additional conclusions can be drawn from this limited data, though interesting hypotheses can be posed about the influence of local weather events, funding for specific commodities like corn, and the impact of lobbyists efforts on agricultural funding allocations. As a graphic exercise, I hope I have proven that rank orderings do not offer much analytical value on their own. I hope I have also suggested that graphics can be used not only for representing findings at the end of the process but for discovering patterns. Graphics are not just for display, they are also for discovery. Neuman, William. (2011, 17 October) “When One Farm Subsidy Ends, Another May Rise to Replace it” Business Section, nytimes.com. Noren, Laura. (2011) US Agricultural Commodity Subsidies by State, 2010“US Agricultural Commodity Subsidies by State, 2010” [Information graphic] and [Data Table – this is a combination of data and analysis originally published by the National Agricultural Statistics Service, a public-facing branch of the USDA]. Environmental Working Group a good source for information on agricultural subsidy spending. 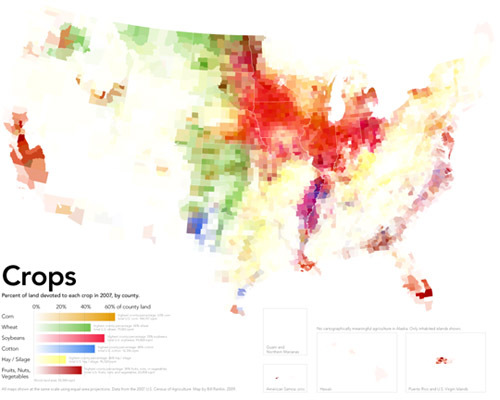 United States Census Bureau, Statistical Abstract of the United States (2011) Agriculture. I put together the diagram above to help me explain how water is delivered and taken away from urban locations. 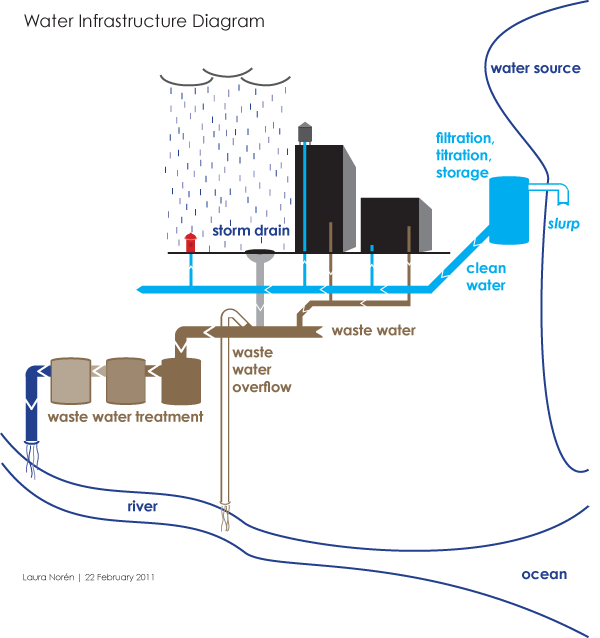 The point I want to make with the diagram is that the infrastructure is designed to deliver water to ‘typical’ buildings and that this means people who are wandering around cities where buildings are all private also lack access to water. There is a political debate going on right now about whether or not access to water is a human right – the UN voted on this and decided water IS a human right but large countries like the US disagreed. When the US does not back UN resolutions, those UN resolutions tend not to mean as much. The diagram above contains none of the politics of the discussion below. For me, it is important to attempt to create graphics that are not political, even when I am creating them for the express purpose of delivering a presentation that takes a side in a political fight. For me, the challenge is two-fold. First, I face the technical difficulty of creating any kind of complex diagram. I’ll leave questions about execution out of this particular discussion though feel free to comment on execution below. Second, when I know I have a political message that I want to keep out of my graphics, I am often too far into my own head to be able to step back and determine whether I have created something that is both comprehensive enough to tell a complete (but apolitical) story and one that does not drift into the political. As it is, this diagram seems to err on the side of being incomplete rather than being more fully detailed where the details start to carry politics with them. My larger point is that this is one way in which cities are exclusionary zones by design. It would be easy to find a way to provide the basic infrastructure to supply water outside of buildings – fire hydrants do just that. But maintaining the ‘last mile’ of infrastructure is almost always completely given over to the private sector. Individuals and companies maintain bathrooms with all of their fixtures, cleaning, and maintenance requirements. This is big business. 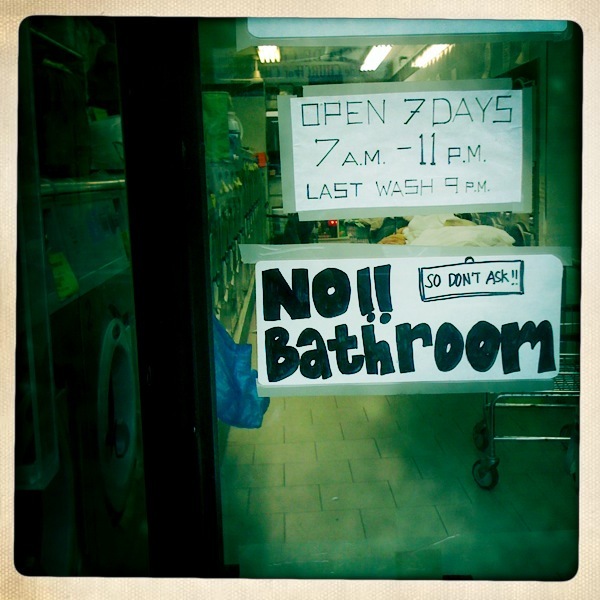 Just about every shop and restaurant on the street in New York reserves the rights to the bathroom for customers only. One of Starbucks redeeming qualities is that their bathrooms tend to be open to all, proving that it is possible to continue to service a relatively affluent clientele no matter who is in the bathroom. The word on the political street is that even though Obama’s stimulus efforts contain plans to address infrastructure, water infrastructure has been taken off the table at this point. Our water infrastructure is ageing; most of the current infrastructure is due to age out of acceptable functionality in the next ten years. Already there are an average of 240,000 water main breaks. Just yesterday the New York Times reported that a dam outside of Bakersfield is uncomfortably close to catastrophic failure, threatening the lives and livelihoods of thousands of people. There are another 4400 dams in the US that require work in order to fall within comfortable safety ranges. Some are publicly owned, some are privately owned. In either case, it is unclear which entities can foot the bill (projected at $16 billion dollars over 12 years). *This diagram uses New York City as a guide. Not all cities have overflow valves that risk the release of raw sewage due to increases in rain. What’s more, in New York there are some other systems in place to recapture some of the overflow at the point of release. But this is a different kind of political discussion, one that focuses on the other typical focus of water discussions – the environment. Ascher, Kate. (2005) The Works: Anatomy of a City. New York: The Penguin Press. Bone, Kevin, ed. and Gina Pollara, Associate Ed. (2006) Water-Works: The architecture and engineering of the New York City water Supply. The Cooper Union School of Architecture, New York: The Monacelli Press. Davis, Mike. (2006) Planet of Slums. Brooklyn, NY: Verso Books. Fountain, Henry. (2011) Danger Pent Up Behind Aging Dams. New York Times. 21 February 2011. Nate Silver of 538 created this field map of the likely GOP candidates seeking the party’s nomination for President. I note, as does Mr. Silver, that none of these candidates have yet announced official intentions to run. Mr. Silver and I seem to share a fondness for two-axis field maps as a way to wrangle with a pool of qualitative information. Earlier, I used the same kind of strategy to sort my thoughts regarding peeing in public. 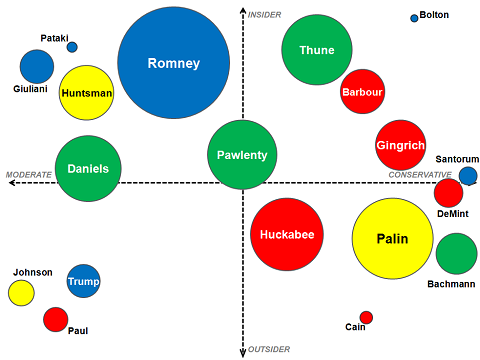 Here Mr. Silver is the field map approach (along with different sized/colored circles) to apply a system useful for thinking through the possible Republican nominees for President. 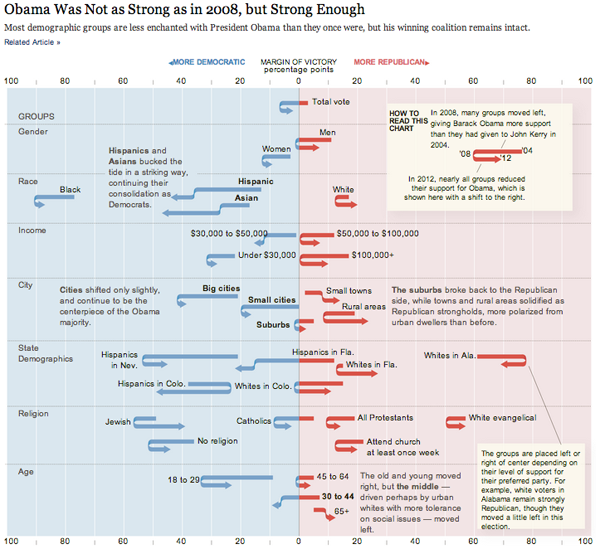 As he explains, the x-axis is one of the most commonly used sorting devices for any candidate – political conservativism on the right, liberalism on the left. In this case, because all the candidates fall to the right of center, ‘moderate’ is used as the left hand label. Mr. Silver admits the y-axis need not have been the one he chose. But he decided to go with insider-outsider status because that will be an important element in this primary battle, given the claims made by the Tea Party. The two axis field map works well for establishing some basic rules with which to sort out candidates who are attached to all manner of qualitative facts that may matter. The field map gives us a way to sort out messy, unmeasurable (qualitative, or quantitative but on different scales) information in a way that allows us a bit of clarity. If you want to use this as a tactic in your own work, I would suggest thinking through a number of different choices for axes. In this case, Silver was fairly confident about the x-axis (level of conservativism) but he was less sure that the y-axis was going to be the most meaningful compared to other choices. He didn’t discuss the other y-axes he might have considered – I can think of a few – but the point is that if you are using this approach in your own work, you need not limit yourself to coming up with one field map. In a situation like this one where you are reasonably certain about the x-axis, keep that same x-axis but redraw the field map with multiple y-axes. Maybe one of them will make the most sense. Likely they will all make some sense when it comes to explaining some things, but not as much when it comes to explaining something else. It is acceptable to end up with an array of field maps, not just one. The social world is a complicated places. Expecting it to fit into a two-axis field map is unrealistic, but helpful as a starting point. 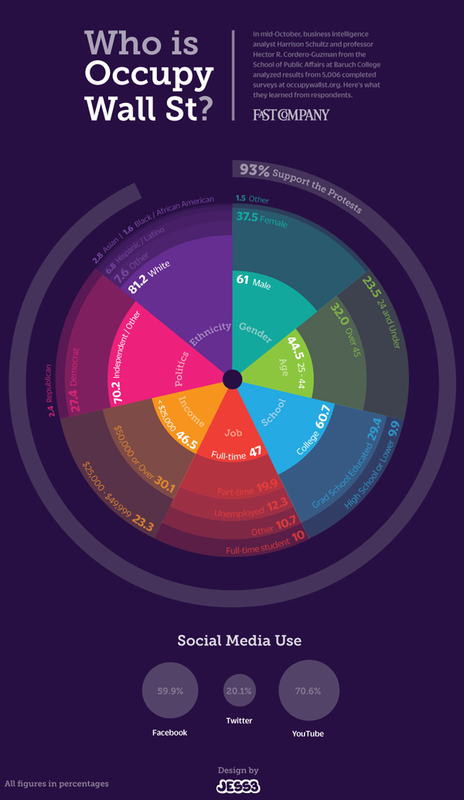 Also, in this case, I like the use of different sized circles. The bigger the circle, the higher the odds of that candidate’s taking the nomination, according to a third party. I am unconvinced by the use of color. Silver himself wasn’t sure that it made sense to color-code these folks by their region of origin, but he threw in the color just because region of origin has mattered in some elections in the past. Again, if one variable doesn’t quite jive with what you think matters, I might try another. For instance, as the primary race heats up, maybe Silver would want to drop the concern with region-of-origin in favor of something like ‘attitude towards gun control’ or ‘attitude towards abortion’. 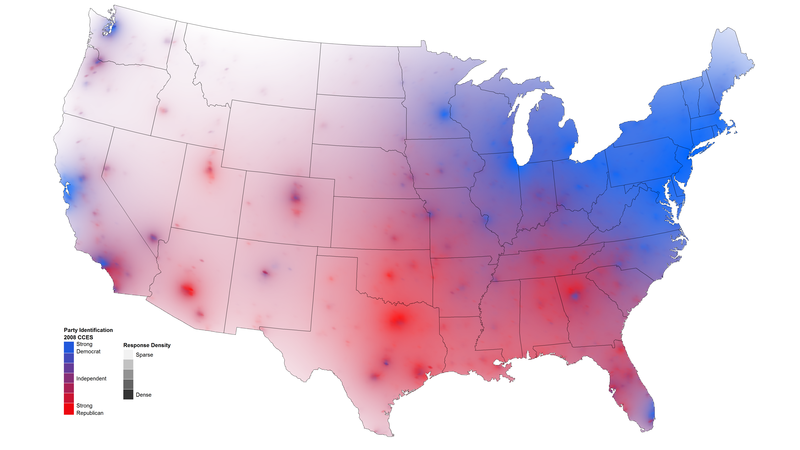 Since neither of those are binary issues, he might be able to get away with using a single hue and darkening it for ardent supporters while moderate supports end up with lighter hues. Clearly, that graphic technique could be used to represent any kind of platform issue. I encourage you to read Silver’s full post if you are interested in figuring out why he put the candidates where he did. No need to rehash what he has to say – he does a better job of explaining himself than I could.